There was no sea ice rebound in 2013, what happened was variation due to weather, the process underway in the Arctic has not stopped. But the increased volume of 2013 could still be one of the most useful features of the post 2010 situation. 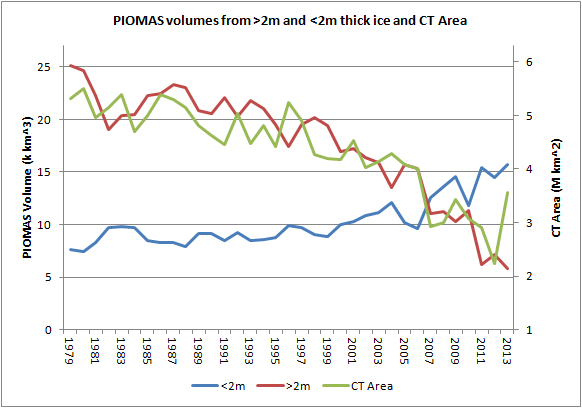 In this post I use PIOMAS data both from the PIOMAS main volume series, and PIOMAS gridded data, also Cryosphere Today Area (CT Area) and NSIDC Extent. To spring back as from a sudden impact. To examine the idea that 2013 represents a rebound from the record low in the first instance we need look no further than conditions over winter. 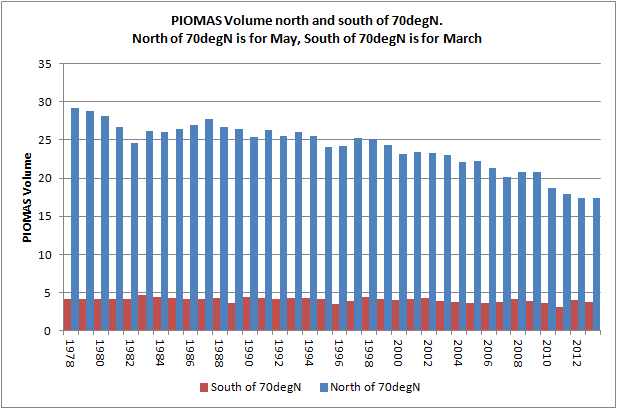 PIOMAS sea ice volume data has been broken down into volumes from north and south of 70degN latitude in May and March respectively (the months of volume maximum for each region). This data shows that both within and outside of the Arctic Ocean prior to the summer there was no volume recovery after the record low of 2012. This also shows that the long term volume decline in terms of maximum annual volume has been from ice within the Arctic Ocean, this is important because the ice outside the Arctic Ocean has no memory of forcings. Ice outside the Arctic Ocean melts out totally during the summer, so is subject only to forcings acting upon it as it grows or melts with each passing season. Within the Arctic Ocean the persistence of multi year sea ice (ice older than one season) means this ice has 'memory' of forcings acting upon it, so it retains the impacts of net forcings and this manifests in a year on year volume decline (e.g. Bitz & Roe 2004). So in the lead into the 2013 melt season there had been no increase in volume after 2012's record sea ice crash. This is unlike the situation following 2007. 2007 was the first of a recent series of sea ice crashes, followed by 2010 and 2012. The volume crash of 2010 is discussed here. In the above plot the rebound following 2007 can be seen clearly as a rise in peak volume within the Arctic Ocean (north of 70degN) in 2008 and 2009. 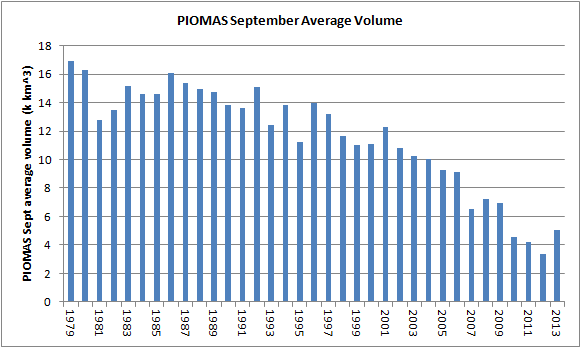 However 2013 showed no such over-winter volume rebound, comparing May 2013 and 2012 shows that May PIOMAS volume was only 0.15k km^3 above 2012, yet by June's average 2013 was a substantial 1.53k km^3 above 2012. What happened in 2013 was that the Spring Volume Loss failed to occur as aggressively as in the other post 2010 years, more here, this then had knock on effects on volume throughout the summer. Why should a rebound in volume be expected after a record minimum? The primary issue here is the thickness/growth feedback, a year producing record amounts of open water will produce more ice volume growth because ice grows by conducting heat from its base allowing growth of new ice at the ice/ocean boundary, so the thinner the ice (or in the absence of ice) the greater the volume gain over the following autumn/winter. This can be seen in scatter plots of both extent and area versus the volume growth from September minimum to April maximum. For both CT Area and NSIDC Extent the record low areas/extents following 2007 produced not only a rightwards shift in the above plots (reflecting lower summer minimae), but also an upward shift showing higher volume gains in the following autumn/winter periods. 2007 and 2012 are the highest two points in the above plots for both CT Area and NSIDC Extent, having the greatest autumn/winter volume gains. 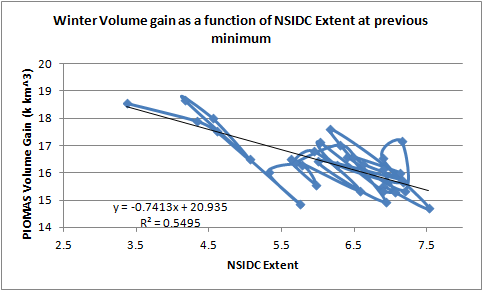 However in 2007 the volume gain was enough to increase winter maximum volume causing a rebound, which persisted for two years, while in 2012 the increase in winter volume was not enough to raise volume above that of the other post 2010 years, indeed all three years were very similar having April volumes of 21.774, 21.730, 21.680k km^3 respectively. I suspect this similarity may be meaningful. So following 2007 there was a substantial rebound of volume, which indicates that the 2007 event took volumes below the local equilibrium. However after 2010 there was no rebound. And unless the weather of the early melt season in 2013 was part of a feedback from 2012 (So far I've not read anything supporting that) the 2013 volume increase cannot be seen as a rebound. Unlike 2007, I suspect that 2010 and 2012 were events chasing a receding local equilibrium point. But that still leaves us with a volume pulse going into the Arctic sea ice system, which could prove useful. First a word about the relationship between area/extent and volume, because while we often concentrate on area and extent as easily read metrics that are in little doubt, it is in fact the volume decline that is driving the decline of area and extent. While there has been an increase in volume of ice under 2m thick in April, the volume decline has come from ice over 2m thick, when NSIDC Extent and CT Area are superimposed upon the decline of ice over 2m thick there is a good agreement. 2m thick is chosen because over a melt season the typical thickness ice can reach from open water is 2m, this makes the 2m demarcation a reasonable proxy for first year ice and thicker mechanically thickened (e.g. ridging) sea ice. The relationship between the decline of thicker multi-year ice and area/extent is to be expected because of increasing open water formation efficiency, a measure of the ease with which a given melt season thinning from a given April thickness can produce ice free ocean by the end of the melt season. Using the same approach as figure 2 of Keen et al, 2013, "A Case Study of a Modelled Episode of Low Arctic Sea Ice." abstract, I have carried out the same calculation and plotting using PIOMAS gridded data. The grey plots are for all years 1978 to 2012, lighter greys for more recent years, darker for earlier. Red is the average of that full period, green is the post 2007 average, blue is the average for 2010 to 2012. The wild variability above 3 metres April thickness is caused by a small number of grid boxes and is probably due to movement of ice, not melting per se. 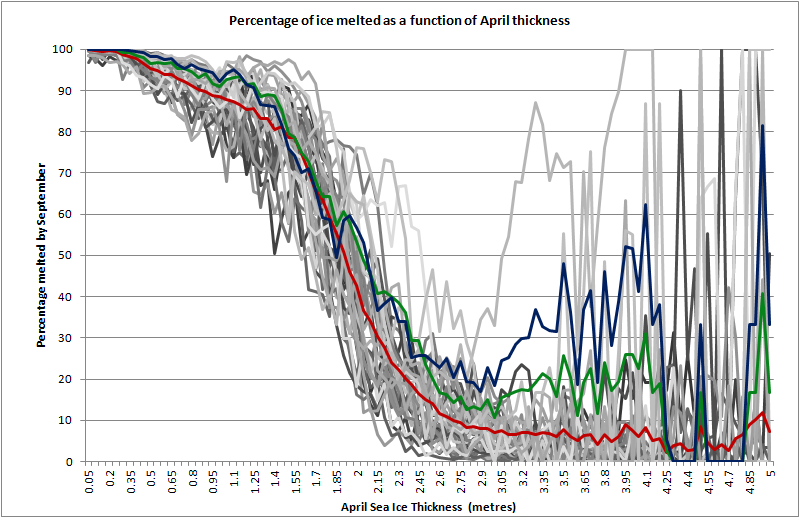 However the bulk of the sigmoid type curve between 2m and 1m thick shows that as the ice thins the percentage that melts to form open water by September increases non linearly as a function of April thickness. 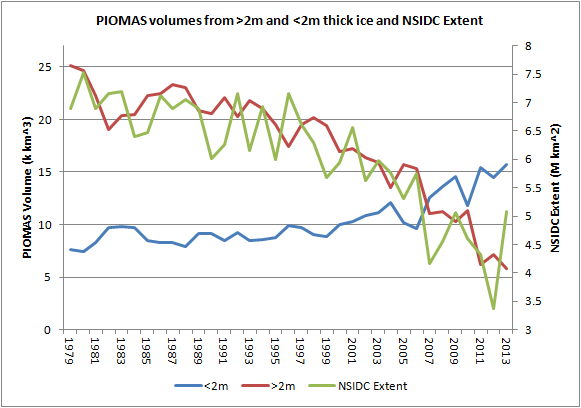 For context, the average thickness in April for the whole PIOMAS domain (north of 45degN) has decreased from 2.13m in 2002 to 1.68m in 2012, this is biassed low by large amounts of thinner ice in seas outside the Arctic Ocean, however as the first graph of this post shows, the decline in volume (hence thickness) has not come from those seas. I am unable to calculate thickness for April 2013 as gridded concentration data has not been released for 2013. So the volume pulse of 2013 might be expected to have some effect on the likelihood of a record melt next year, reducing the chances of such a melt. However as indicated by the above scatterplots using melt season volume gains, the coming autumn/winter volume gain should not be expected to be as much as 2012 or 2007. 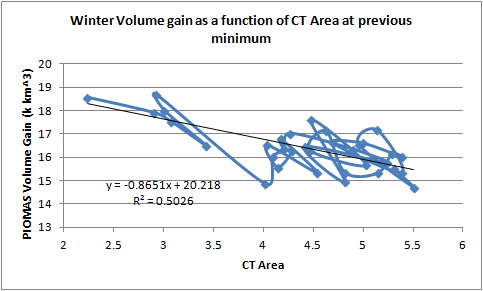 I have used the equations on those scatter plots to produce estimated volume gains for the ongoing autumn/winter freeze, given the low R2 stated on the graph I've applied two standard deviations as the upper and lower bounds, both NSIDC Extent and CT Area produce similar results to one decimal, these are; Upper: 23.5k km^3 Central: 22.1k km^3 Lower: 20.7k km^3. In plain English - the peak volume this year could be as much as 2010 at the same time, or below the previous three years at the same point, but the central estimate is only marginally above the previous three years. Perhaps a simpler way to look at it is to consider the average volume for September. September 2010 to 2012 saw year on year drops in volume, but the volume in the following April for each year was largely the same - that's the thickness/growth feedback process at work. Just as it evened out the drop those years, it might level out the 2013 volume increase. So it might be premature to expect us to see a carry over of this year's volume increase into the future, especially when placed in the context of previous years. But more interesting for me - if April 2014 does see a volume similar to April 2011 to 2013, rather than the whole volume gain of August 2013 being carried over, I think that together with the peak volumes of the last three years it will be strong evidence of the growth/thickness feedback acting as something of a stabilising factor indicating a long(ish) tail, not a fast crash of sea ice. To conclude; yes there has been an increase of volume in 2013, but by the definition of the word 'rebound' this cannot be considered a rebound. Furthermore the circumstances that have lead to this increase in volume are rooted in the early melt season. 2013's increase in volume is due to the atmosphere behaving differently from other post 2007 years throughout the summer, e.g. here. As discussed in the previous post new research from Dr James Screen shows that the string of wet summers in Western Europe are likely due to recent sea ice loss, this is related to a wider pattern of circulation centred on anomalous ridging over Greenland, a pattern which has a role in the Arctic by creating a summer Arctic Dipole. Thus the balance of probabilities now lies with the weather of 2013 being a one-off, not a new normal, and that we should expect the decline of volume to continue in the coming years.